A hat-trick from Dougie Freedman earned nine-man Crystal Palace a remarkable win in a pulsating opening-day clash at Turf Moor. The former Scotland striker gave Palace an early lead with a penalty but goals from Robert Blake - after Wayne Routledge had been sent off - and summer arrival Lee Roche put the Clarets in front. 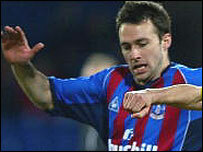 Freedman equalised with his second before the interval and then put the visitors back in front before Shaun Derry became the second Palace player dismissed. But Steve Kember's side held on and substitute Aki Riihilahti might even have added a fourth before the end. The Eagles got off to a flier when Freedman was brought down by Burnley new-boy Roche in the box with the game only three minutes old. The Scottish striker picked himself up to confidently convert the penalty but the visitors' soaring early-season spirits were swiftly dampened. Within five minutes they were a man down and back on level terms when Routledge was dismissed for bringing down Burnley's loan signing Luke Chadwick. The referee originally awarded a penalty but after consulting his assistant changed his decision to a free-kick, which Blake dispatched right-footed from the right side of the area. Burnley went in front in the 19th minute when Roche, signed from Manchester United, controlled a cross-field pass and smacked the ball home from 20 yards with the aid of a deflection. Palace boss Steve Kember responded by replacing Kit Symons with Gary Borrowdale and the visitors equalised with a superbly-taken second from Freedman after 32 minutes. The striker collected Ben Watson's pass, drifted past the last Burnley defender and then rounded keeper Brian Jensen before finding the net from an acute angle. Freedman struck again in the 67th minute when Jensen parried Andrew Johnson's cross into his path and he completed his hat-trick from six yards. The Eagles were immediately reduced to nine men when Derry was dismissed for a foul on Paul Weller. But they might have added to their lead with 10 minutes left when Riihilahti had a shot brilliantly saved by Jensen. Burnley: Jensen, Camara, Branch, Gnohere, Roche, Little, Chaplow, Weller, Chadwick, Alan Moore, Blake. Subs: Grant, West, O'Neill, Scott. Crystal Palace: Clarke, Powell, Symons, Popovic, Butterfield, Derry, Watson, Routledge, Johnson, Freedman, Shipperley. Subs: Berthelin, Black, Riihilahti, Borrowdale, Smith.